A limited number of assistant conductors will be selected to participate in the festival. 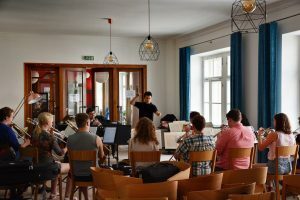 Conducting Apprentices will participate in the preparations for the productions of Mozart’s operas Don Giovanni and Le nozze di Figaro, and will conduct these works extensively in staging rehearsals with the cast and chorus. Apprentices will attend and participate in orchestra rehearsals and concerts and have the opportunity to conduct the orchestra in rehearsals. Apprentice Conductors will prepare and conduct a fully-staged opera scenes program, which will include scenes from important Czech operas such as Rusalka and Prodaná nevěsta (The Bartered Bride), in addition to standard operatic repertoire. Students will work directly with coaches and faculty on all aspects of presenting opera. Conducting Apprentices will have intensive mentoring from the festival conductors, take private lessons and coachings with the PSN faculty, and have opportunities for resume building, social media, networking and audition preparation. They will participate in a conducting masterclass with guest conductor Andrés Cárdenes, as well as have the opportunity to participate in vocal and instrument specific masterclasses. In addition, students will gain practical experience through administrative activities in the logistical and operational aspects of running an orchestra, producing an opera and mounting an international summer music festival. All program fees and conditions apply as listed on the Application Information page. PSN is looking for a qualified candidate who is interested in coordinating the chamber music program in collaboration with the Artistic Director/designated PSN faculty. This person may have the opportunity to participate in a pre-festival internship and this role can be combined with any of the following programs: Arts Admin, Orchestra, Conducting. If interested, please submit your resume and cover letter including your background in chamber music and your interest in this opportunity. You will be contacted for an interview after the application deadline.